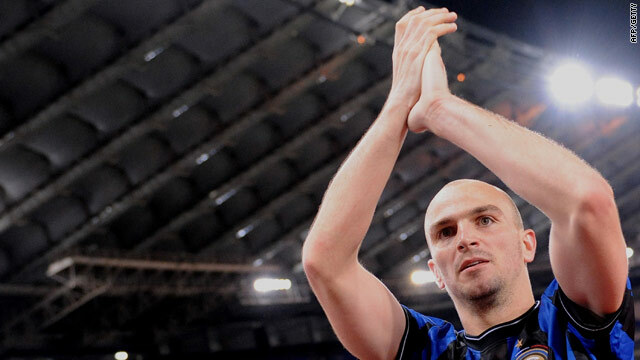 Inter midfiielder Esteban Cambiasso salutes the Inter fans after their win over Lazio. (CNN) -- Inter Milan stayed on course for the treble after beating Lazio 2-0 on Sunday to open up a two-point gap over Roma in the Serie A title race. It completed a superb week for Inter, who reached the final of the Champions League with an aggregate win over Barcelona on Wednesday. They also face Roma in the Italian Cup final next Wednesday having leapfrogged the capital side with their latest victory. Lazio, fighting a relegation battle, were no match for Jose Mourinho's high-flyers, who are bidding for a fifth straight league title. Argentine defender Walter Samuel headed in the opener just before halftime from a Wesley Sneijder cross. Inter continued to press after the break and Thiago Motta scored the second from a Maicon corner in the 70th minute. Roma had briefly led Serie A after their 2-1 win at Parma on Sunday with both teams now having two matches left to press their title claims. Earlier, Sampdoria and Palermo both won to stay locked in the battle for the fourth and final Champions League qualifying place. Sampdoria, who lead Palermo by two points, beat already relegated Livorno 2-0 while the Sicilians beat Siena 2-1. The defeat sends Siena down. In other games, Napoli and Juventus booked Europa League places. Napoli won 2-1 away to Chievo while Juve dropped to seventh, but secured their spot with a 1-1 draw at Catania. At the other end of the table, Bologna drew 1-1 with Atalanta to improve their chances of surviving the drop. In the Netherlands, FC Twente sealed the Dutch title with a 2-0 win over NAC Breda to leave them one point ahead of Ajax, who beat NEC Nijmegen 4-0. It is a remarkable triumph for a side managed by former England boss Steve McClaren who could not match the spending power of their Amsterdam rivals. Bryan Ruiz and Miroslav Stoch scored the Twente goals to clinch the championship and a Champions League place.